There are quite some photo sharing-services around. And almost no one did seduce me to use them... expect one: Bannka. It's magic is simplicity. Instagr.am has a tons of effects (and not available on Android), but what for? I already have my photo editor, one out of many dozens in the marketplace. Others have big apps, irritating timelines or no decent comments. Most of them has a problem with location-based publishes. Bannka is simplicity pure, fast, has a nice timeline accessible from the desktop or mobile devices, both cleaned up. Just press snap, shoot your photo, press okay and you're done. The image will appear, including location, in your stream. It can automatically send your photos (including location) to Twitter, Facebook and Google Buzz in real-time. If you like, you can choose a picture from your Gallery directly, selecting "Send" and choose "bannka" when prompted (Froyo 2.2). And so you can edit your photo with the editing software of your choice (PicSay, Photoid, Ascii Camera, etc.) and "bank" it . It's a perfect tool for me. When I'm Geocaching or being on the go, I don't want to mess with controls. I want to shoot and send. Simple and quick. You can give it a try if you like, it's free. 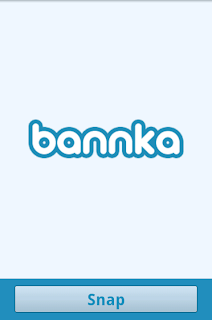 You can find my bannka-account here.